Lifestyle blog for men over 35. I write about clothes, fashion (a bit), suits, fragrance, gadgets, shopping online and off, style. From a beginner who's happy to share his learning and his mistakes. Laptop bag: Knomo know more? It's raining so it must be summer and that means Knomo, the very plush bag people, are promoting their new laptop bag range. I've had a look at the Kilkenny (pictured), designed for an 11in Macbook Air. First impressions are very positive. It's stylish, lightweight (unlike some of the laptop bags I've tried in the past) and there are compartments for cables, pens, an external pocket for a paperback. It's comfortable to carry and the leather is soft, giving it a bit of a luxury feel (which I'd pretty much take as read since it costs £145, two of those and you could get a cheap laptop, never mind the bag). It's slightly flawed in two areas. First, as I've said before about Knomo, security is an issue. The bag closes with magnetic fastenings that can be opened silently by a pickpocket - so I'd use this if I were driving to, for example, give a presentation, but not if I were using public transport. More importantly for me, it's compact like the 11in device it's designed to carry - so you needn't expect any room to hold much else. Even the power cable for the 11in notebook is a bit of a squeeze; the external pocket takes a paperback quite comfortably but don't even think about putting a magazine in as well as the notebook. 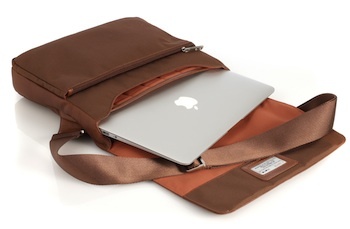 It's designed for people who just want to carry the notebook and nothing else. In the hot summer (hah!) you're likely to be looking at bulkier stuff like a bottle of water. It's a stylish item and if you appreciate its limitations it'll be fine, but for me the size and tailoring to a particular item mean I'm unlikely to buy one. I wish I'd never started this. My wife and daughter are away on a residential violin course, leaving me, the dog and the two cats to look after each other. In other news, yesterday my wife casually mentioned that when she tried to put my shirts away after ironing them my wardrobe nearly fell on her when she tried to make space in it - it was that tight. (I should add I'm not one of these blokes who expects ironing to be done for them - I was doing other stuff that was equally domestic and useful at the time, in case anyone's wondering). So, clearout time. This, I find, is slightly easier without my family around. There was a loose screw in my wardrobe door a while ago which damaged some of my shirts; nonetheless last time I tried a clear-out there was a chorus of "oh, but I like you in that" every time I pulled out a hole-infested shirt to throw away. So I didn't throw them but also haven't worn them since. And now in the absence of any vocal support, I can bin them with equanimity. I'm an idiot with shirts, I know. We go out shopping, I like something I see and I buy it. Only later does it occur to me that the wardrobe is already packed and bursting. So here's some stuff I've learned. Don't buy stuff on a whim. If you need shirts go out and look for one. Don't just take a fancy to one and acquire it. Read the label carefully. "Slim fit" may look like a harmless slogan in isolation but when you get it home the shirt will take up residence in the corner of your wardrobe, unworn, sniggering at you. If you haven't worn your "favourite shirt" for over a year, it's not your favourite. Bin it. If you *must* get suckered into buying shoe trees with new shoes, they belong in the shoe and not next to it otherwise you take up twice the space. Also get wooden ones, they'll hold the shape better than the plastic ones I was given in my twenties and even deodorise a bit. If you were given something tacky in your twenties and still own it, don't mention it in a blog whatever you do. If you buy suits as I do from A Suit That Fits or King and Allen (ASTF recommended for excellent value, K&A for a more thorough tailoring experience including a baste fitting, superb suit that's drawn loads of compliments - and a higher price) you're likely to end up with a lot of suit carrier type bags. You don't need them all - bin all bar one. Use it if you're taking the suit for alterations or they'll give you another one on the way out. I'm being ruthless. If I'm not convinced something looks good, or if it's a bit worn, it's going. I have plenty of stuff - the charity shop will be delighted. Obviously if it's junk it goes, but if it's wearable but not by me then someone else is welcome to it. And after this I fully expect to start hoarding the bloody stuff all over again.